Last Friday, Smyth's investment vehicle, Fitzwilliam Finance Partners, submitted a planning application in conjunction with Arnotts to Dublin City Council to separate numbers 7, 8 and 9 Henry Street, which currently forms part of the Arnotts store, into a separate building of approximately 40,000 sq. ft. While the proposed separation of numbers 7, 8 and 9 would see Arnotts' physical footprint being reduced, the Henry Street store would still retain its position as Ireland's largest and only full-line department store with 250,000 sq. ft of retail space. Interestingly, the removal of numbers 7, 8 and 9, which currently house Arnotts' ladies shoe department, would also see Arnotts restored to its original footprint. The units that Smyth is now seeking to redevelop were only added as an extension in the 1960s. A spokesman for Fitzwilliam Finance Partners said that, subject to planning permission being received, it would be spring 2018 at the earliest before any works take place to separate the buildings. The Sunday Independent understands that Smyth reached an agreement with the Selfridge Group last October to retain numbers 7, 8 and 9 - along with Arnotts' other development properties - as part of his overall deal to sell the remaining 50% stake his investment vehicle, Fitzwilliam Finance Partners, held in the business to the group. Fitzwilliam Finance Partners had earlier been backed by the Weston family when it bought that 50% stake in Arnotts from US private equity giant Apollo, bringing to an end an effective 18-month stand-off in relation to the store's ownership and future direction. While the proposed separation of the buildings will no doubt come as a surprise to the store's staff and its customers, it is something that fits in with both Smyth's and Arnotts' vision. Smyth for his part intends to create a 40,000 sq. ft unit suitable for occupancy by a major international retailer. While it is understood that a number of big names such as Apple, Next and other Oxford Street retailers have been seeking suitable premises in Dublin city centre, a source familiar with the matter said it was unlikely Smyth would engage with any potential tenant prior to the necessary planning approvals being obtained. One industry source estimated the redeveloped building's potential value - upon completion, and depending on the tenants secured, the strength of the covenant and the rent achieved - at up to €50m. It is expected that Smyth would look to sell the asset once it is tenanted, possibly to a pension fund or a family office, both of which would have an interest in acquiring what the same source described as a "trophy asset". Contacted for comment on the proposed changes, a spokesman for Arnotts said: "Arnotts is committed to enhancing the shopping experience for its customers while cherishing the store's unique heritage. Our vision is to return Arnotts' retail footprint to the original iconic building. Following the proposed changes, Arnotts will remain the largest and only full-line department store in Ireland, and one of the biggest in Europe." While Arnotts' spokesman declined to make any further comment on the matter, the Sunday Independent understands from Fitzwilliam Partners that the proposed separation of Arnotts' premises will have no impact on the numbers employed at the department store. 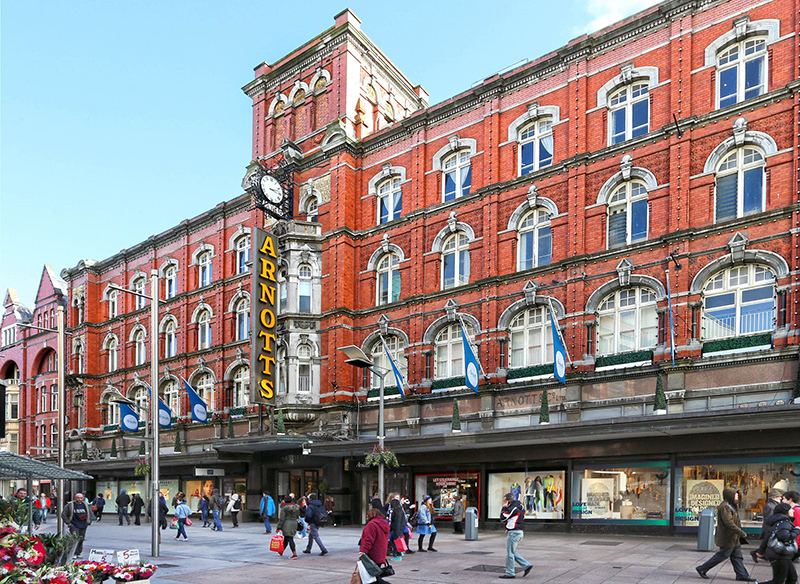 A spokesman for the company said: "The separation of the buildings will see Arnotts return to its original retail footprint, something that was envisaged for the business at the time of its acquisition last year. The change will have no impact on staff numbers in Arnotts. The separation is part of wider plans that Arnotts are progressing to improve the shopping environment for their customers." Quite apart from his plans for numbers 7, 8 and 9 Henry Street, Smyth was already in the news last week following reports that Ziggurat, the UK-based student accommodation specialist, had acquired two former Arnotts car parks on Dublin's Upper Dominick Street from him as part of its plans to progress with the development of 800 new student bed spaces in the capital by 2019. Last month, Smyth agreed the sale of the former Boyers store building on North Earl Street to UK billionaire Mike Ashley's Sports Direct retail chain for €12m. While the closure of Boyers could potentially have seen the solicitor and developer drawn into controversy, coming as it did after the public furore sparked by the closure of the iconic Clerys by its new owners, Natrium, Smyth managed the wind-down of the store's operations over four months. In terms of the redundancy given to Boyers' employees, it is understood this amounted to five-and-a-half weeks' of pay per year of service. Clerys direct employees, in contrast, received the statutory amount of just two weeks' pay per year of service.